Microwave Fudge - 2 Minutes and 2 Ingredients for the BEST Fudge! 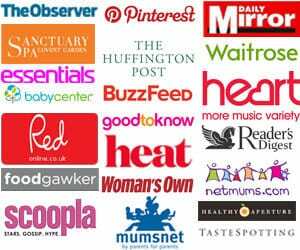 You are here: Home / Recipes / Microwave Fudge Recipe – TWO Minutes TWO Ingredients! 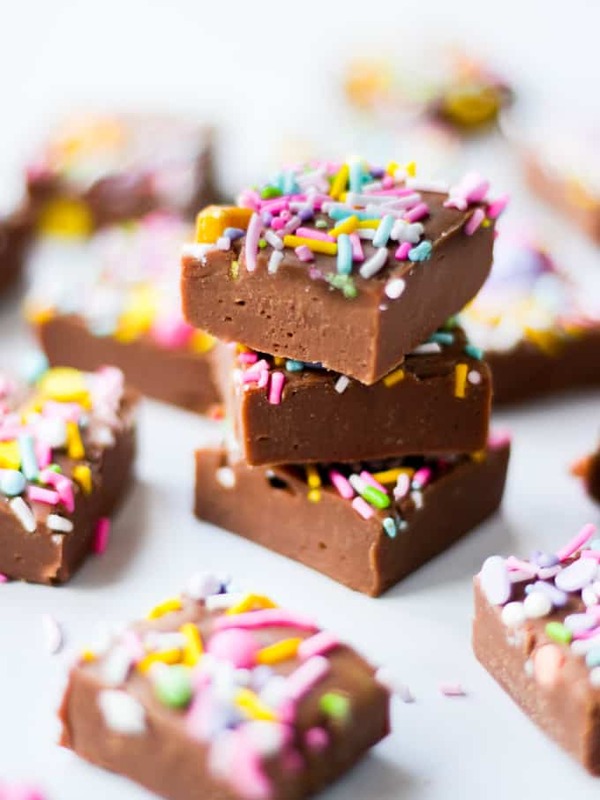 Microwave Fudge Recipe – TWO Minutes TWO Ingredients! This Microwave Fudge recipe uses just two ingredients – chocolate and condensed milk. It works every time and is made in just two minutes. 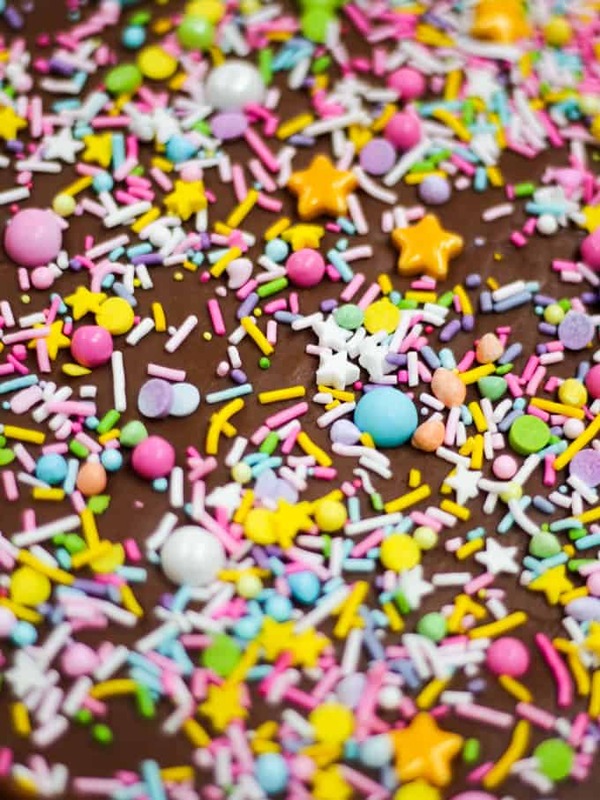 Add your own flavourings and toppings for truly delicious fudge. Read on for tips and tricks for the VERY best microwave fudge. My tiny babies turn SIX in a couple of days, how can that possibly be?! Life has changed so much in that time. Not least of all the fact that having a pair of twins has made me learn to do everything and anything more quickly. One handed nappy changing? Mastered. Filling the washing machine whilst overseeing homework? Nailed it. Speeding up any and every recipe? YES! And so, I present you with Two Minute, Two Ingredient Microwave Fudge. Homemade sweet treats make such a thoughtful gift, but even more so when they are secretly super easy. Shhhh, I won’t tell anyone if you don’t. I pack the pieces of Microwave Fudge, fresh from the fridge, into little bags like these cellophane bags (from Amazon). It adds a special something to make them feel like a real gift. The basic recipe for this fudge is so simple, just chocolate and condensed milk. You can cook this in a microwave or a slow cooker. Of course it’s SO much quicker in a microwave though. Just cook it for 30 seconds, two or 3 times, beat really well and pour into a lined dish. Refrigerate overnight and there you have it, delicious creamy microwave fudge. 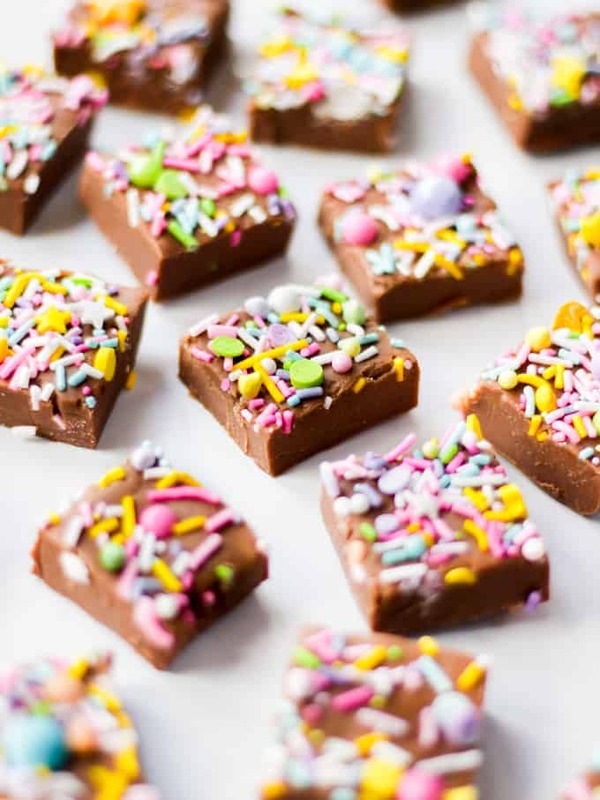 The basic ingredients for this fudge differ from traditional fudge as you’re not caramelising sugar to set the fudge. The chocolate sets the fudge and the condensed milk adds the sweetness and texture. 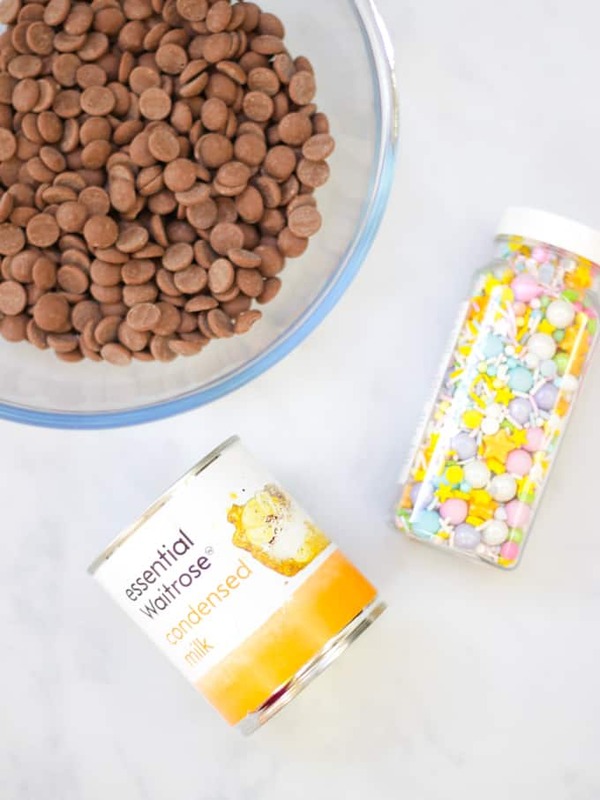 Be sure to use condensed milk, not evaporated milk or ready made caramel. How long can you keep homemade fudge? There doesn’t seem to be any hard and fast rules on this, but I’ve kept it in the fridge for a week and it’s been absolutely fine. It will go really quite firm, so just let it soften a little before eating. I used my favourite Callebaut chocolate for this recipe. This chocolate is just amazing, it melts so well and really makes a difference to any recipe. When you buy it in bulk (1kg bags at a time) from Amazon it works out about the same price as supermarket chocolate. A good investment I think as it really does make SUCH a difference. You can add extra flavourings if you’d like, like this gorgeous vanilla extract (it’s THE best!). I use milk chocolate in the fudge this time to give a really creamy flavour. You can use dark chocolate if you prefer or half and half works really well too. If you’d like to use white chocolate, you will need to use more to keep the fudge stable. 500g instead of 400g works well. This fudge is kept stable by being chilled. Keep it in the fridge until you need it and it you’re giving it away, suggest that the lucky recipients keep it chilled too. Fancy some other sweet treat recipes? How about my Gin and Tonic truffles or my Cookies and Cream Slow Cooker Fudge? Hope you enjoy this recipe as much as we do. I’d love to know how you got on and what you thought of it if you make this Microwave Fudge recipe. Please rate the recipe and leave me a comment below if you do. 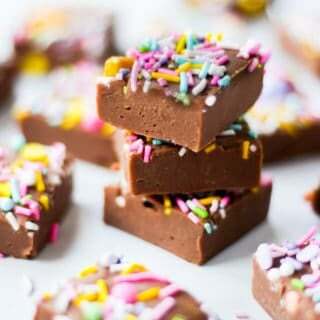 This Microwave Fudge recipe uses just two ingredients - chocolate and condensed milk. It works every time and is made in just two minutes. 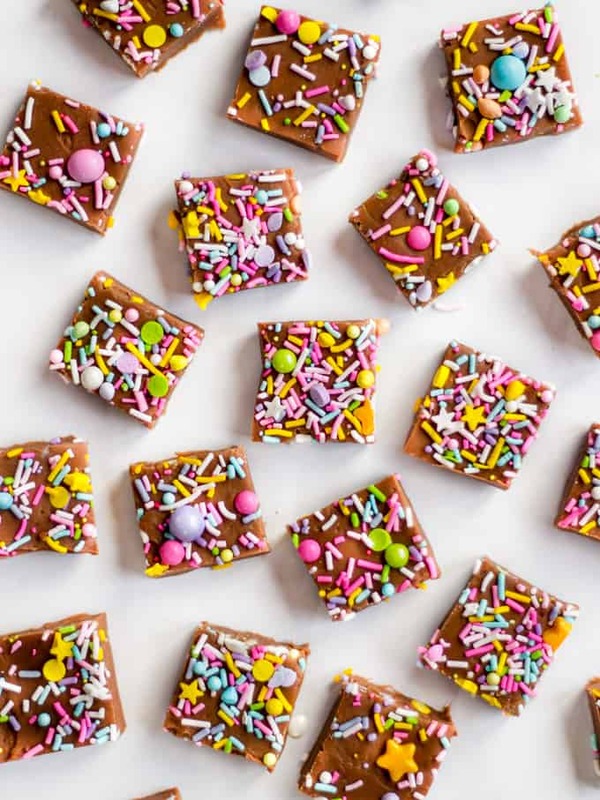 Add your own flavourings and toppings for truly delicious fudge. Read on for tips and tricks for the VERY best microwave fudge. 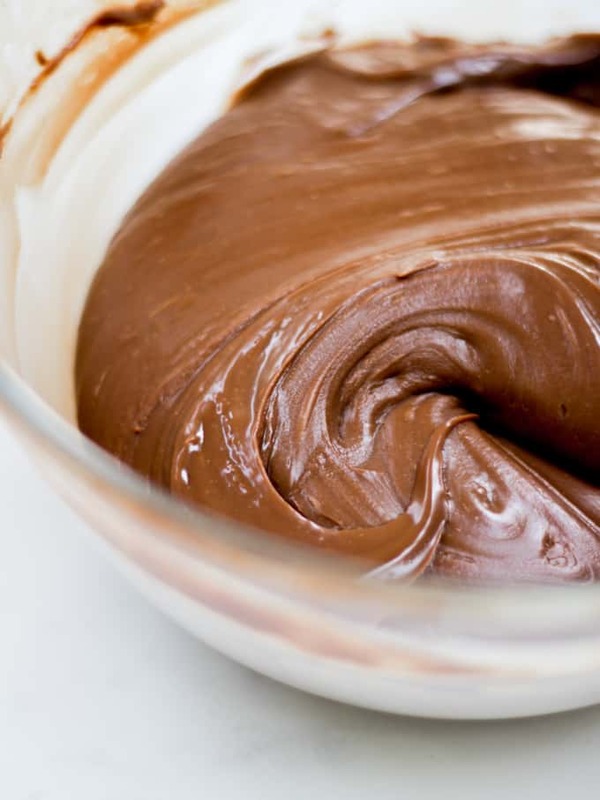 Put the chocolate and condensed milk into a large bowl. Microwave for 30 seconds, beat well. Repeat once or twice until very thick and smooth. Pour into a small baking dish lined with baking paper. Smooth out and add sprinkles if using. Cut into small cubes and store in the fridge until needed. Love this recipe, keep up the good work!